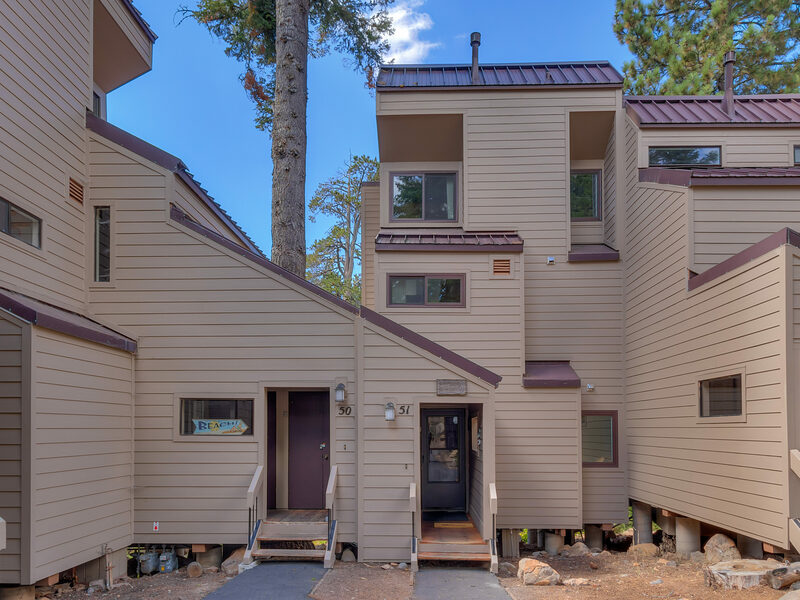 In Carnelian Bay you’ll find Greenwood, a comfortable mountain townhome with forest views located in a terrific development. With room to sleep six, this is the perfect place to enjoy a friends’ getaway or a family vacation. While current entertainment options are included, make memories showing the kids how to go old school with Greenwood’s Multicade Arcade. The townhome’s entry level includes two bedrooms. 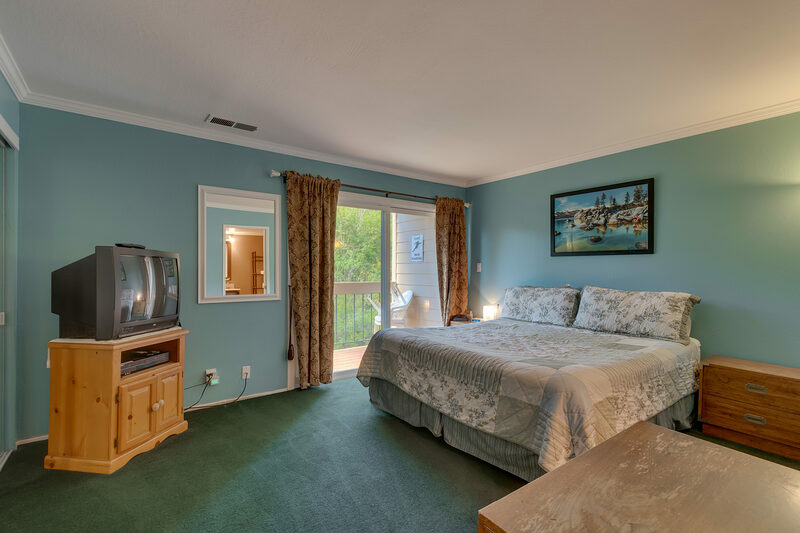 The master bedroom has a king bed, TV with DVD player, and a glass sliding door to the covered deck. The cheerful second bedroom has a cozy queen-size sleigh bed and white wainscoting. 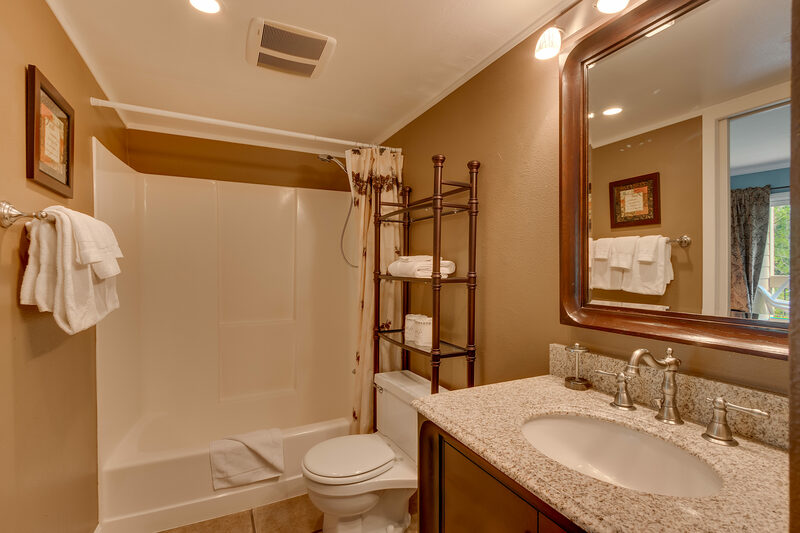 There is also a full bath with a tub/shower. The laundry closet is just across the hall. On the second level, the living room, dining area, and kitchen are all together, so everyone can gather in one place. You’ll also find the second full bathroom. Plenty of bath linens are provided. Warm up by the wood burning fireplace in the living room. Relax on the comfortable sofas, leather recliner, and sunny window seat. There's a large flat screen TV with cable and DVD player, VCR, VHS movies, stereo, and Wi-Fi. The adjacent covered deck features a gas barbeque. The well-equipped kitchen includes everything you need to create family dinners and anything else you crave. Clean up is easy with the all-important dishwasher. There are four chairs and a bench at the dining table and two chairs at the breakfast bar. On the third floor is the loft bedroom, which has a queen bed and a Multicade Arcade. NOTE: Carnelian Woods hot tubs open daily in summer and winter, Saturdays only in spring and fall. Pool open summer only. Start and end dates will vary based on weather. Great time and beautiful place. This unit we rented was clean and in good condition, providing a nice play to stay for some of our family members. First Accommodations, as well as Carnelian Woods, was very easy to work, organized, and efficient in terms of check-in/check-out. Thank you! We have rented from this townhouse area before, a smaller unit. This year we were looking for some more room. This place certainly provided that. It was clean, roomy, close to the clubhouse (short five min walk along the trail). It was very out dated except for the bathrooms but everything worked and was functional. It felt very 'Tahoe' inside. We really enjoyed out stay. Was their for a softball tournament so not a lot of time their, but it was clean, comfortable, and a convenient location. easy process, clean property, great location and amenities. Overall, we had enjoyed our stay. 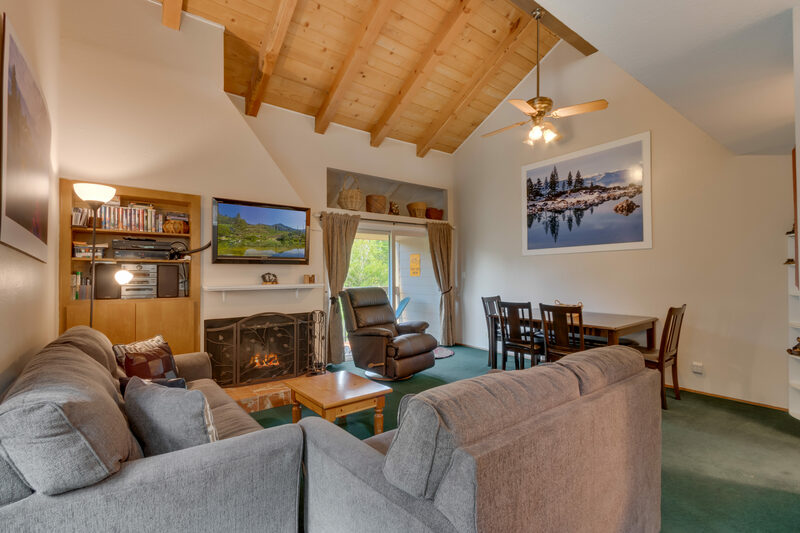 The rental place is nestled in a quiet area, great neighborhood,close to Lake Tahoe. Lot of activities like trekking, biking along the lake, hiking etc. is possible. Lots of restaurents and shopping facilities. Very nice. Cabin was outfitted great. Nice place, very comfy. We had major problems with the Dish - getting local channels took 2 hours sometimes. Frustrating. Internet access was great - very nice BBQ. Looked like they'd recently updated bathrooms and painted, consequently water was off when we arrived but Prop. Mgr was very responsive with our issues. This is a nice area at the north shore with lots of trees and just a short drive to stores & restaurants. The distance to the guest facilities (pool, jacuzzi, rec room, etc.) is not convenient for walking nor is the beach. Condo access is via a steep and uneven pathway from the parking area. The staff & management were most informative and helpful. The accommodations were excellent and left like home. Also the skiing locations were not that far. This was a nice property in a great location just off the water by a walking block. It is quite large in terms of bed spaces. The kitchen is small, but nice with eating area/dining room. It is nice, but not fancy. The community is very family oriented with a club house, pool (good for kids) and tennis courts. Nice Carnelian Bay location. 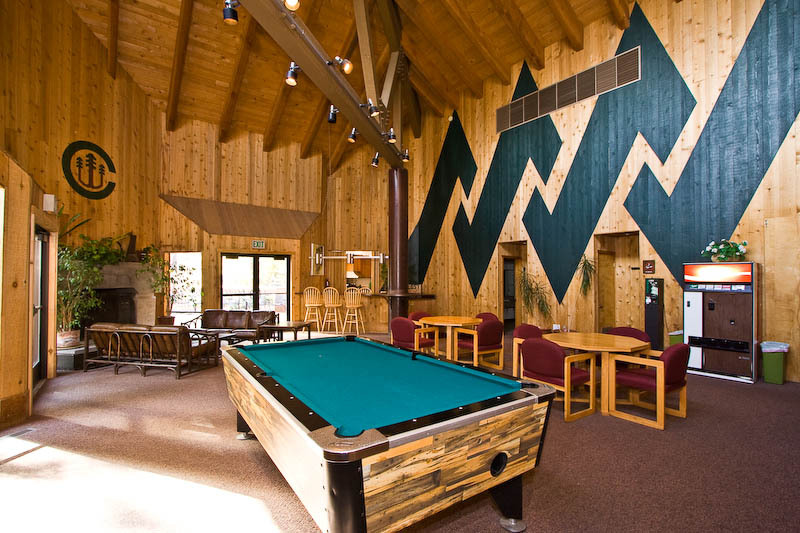 Great location in North Tahoe. Amenities were an added bonus, Especially on a rainy day. Enjoyed the Par Course every morning and the Pool & Hot Tub every night. Great place to stay for a family or group vacation. This condo was in need of updating, other than the bathrooms, it looks like nothing much has been updated in 20 years. The beds were comfortable, and the living space nice for visiting and socializing. The kitchen lacked a decent coffee pot, and did not have a blender, but there was plenty of plate, flatware and glasses. We booked this condo just a week before leaving for a last minute summer vacation. The condo is in a really good location and Carnelian Woods is great for families due to all the amenities. The condo itself was very clean and has nice new bathrooms. The kitchen is clean but original and could really use updating (only new flooring). It is small but stocked pretty well with pots, pans, dishes, etc. Kitchen cabinets are old and unlined (liners would help give them a cleaner feel down where pots are stored). Upstairs loft bedroom could use new mattresses, but are okay. Definitely need to put your earlier risers up in loft as once someone is in the kitchen/living area below, it is difficult to sleep. Downstairs mattresses are fine. I really liked the location of the condo and Carnelian Bay is gorgeous and less crowded. I didn't love the three level floor plan, but it worked out fine. I wished there were larger decks to enjoy the outdoors from, but nothing owner can do regarding that. Upper deck is mostly filled with a large BBQ grill with room left for just one chair. We had a great vacation overall and were glad we had a nice, quiet, clean place to stay. Perfect for our family. Reasonably priced cabin. The cabin was spotless. Perfect layout even with our 5 kids there was enough beds and enough space. 20 mins from Northstar. The kitchen was ok but worked for feeding everyone. I would recommend this to everyone with a large family and a budget. The location of this unit is perfect. Close to the beach and restaurants. I took my 5 grandchildren up to Tahoe We had plenty of space plus we loved the pool. The unit is fully stocked with everything you need. I plan to rent here again. We've rented a home in the Agate Bay neighborhood......which touches the Carnelian Woods Condo Development......for 32 years.........but had never stayed at the condos. We were very curious and a bit skeptical about staying there. However, we were pleasantly surprised. The condo we stayed in was immaculately clean and very well stocked. Furniture was comfortable and attractive. Truly, the only thing we missed was a big deck to hang out on, but simply adapted by spending more time at the beach , pool or taking short rides. Also, the pool key was not in the condo when we arrived, but a call to Trent at the Rental Service, and the problem was solved within a few hours. Excellent and well-maintained recreational center. Very nice condo for the price. We had a wonderful vacation and found the Carnelian Bay condo to be very comfortable and pleasant. The location was great with grocery shopping and beaches nearby, the kitchen was small but adequate, and the unit was spacious and clean. The staff at the rental office was beyond helpful. They suggested great hikes and fun things to do in all types of weather. I am sure we'll come again.